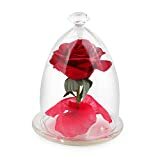 “Beauty and the Beast” style silk rose with fallen petals, and a Led strip light, in a glass bottle. The domes are glass. This is one solid piece, the glass does not come off the rose. It wonderful and unique idea for a Cosplay, an engagement, a proposal, wedding gift, wedding cake topper, wedding decoration, graduation gift, Mothers Day, Valentine’s Day, an Anniversary, a Wedding Accessory, a birthday gift, housewarming gift or just for the difficult to shop for person in your life. Or just for you, just because!